Shea and the sweet neighbor from next door were bored on Saturday, so I got them distracted with a little stitching. It was fun to watch them work. I stopped by the thrift store today to check and see if they had any good sheets for quilting. 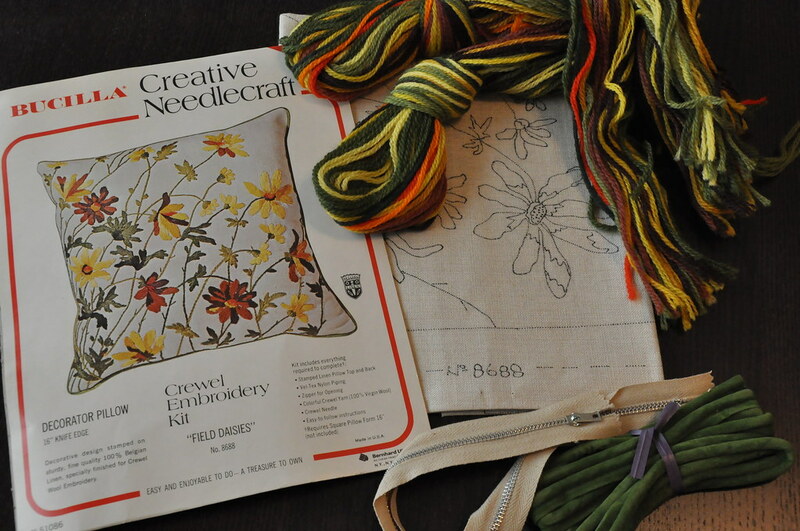 I found this cute orange set, but I also found some other crafty goodness. 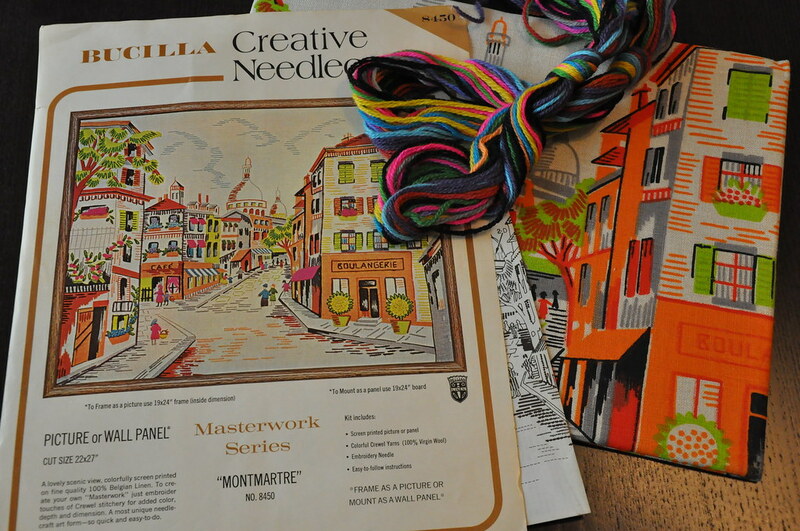 I could not resist this fun crewelwork set of a street in Montmartre. I adore Paris. See the dome of the Sacré Coeur peeking out there in the distance? 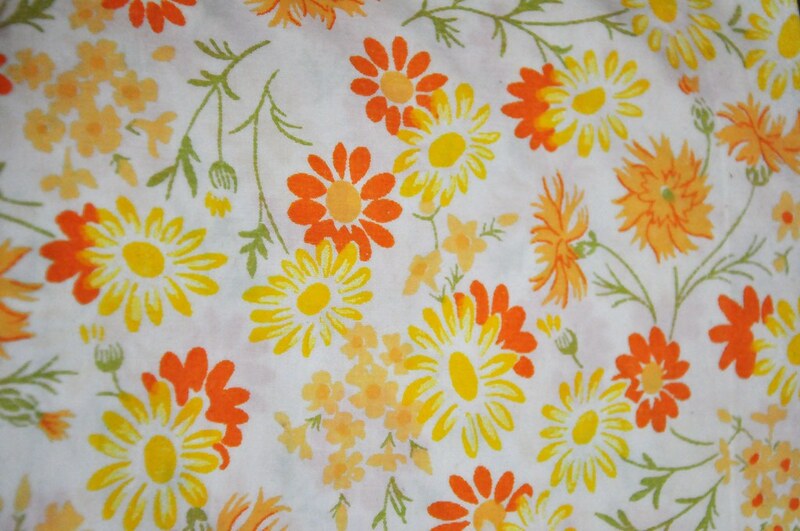 The colors are 70's funky-fabulous! Wool thread and Belgian linen, all for $1. I must have stitching on the brain after Saturday, because I couldn't leave this one there either. The complete kit for just a dollar, circa 1972. 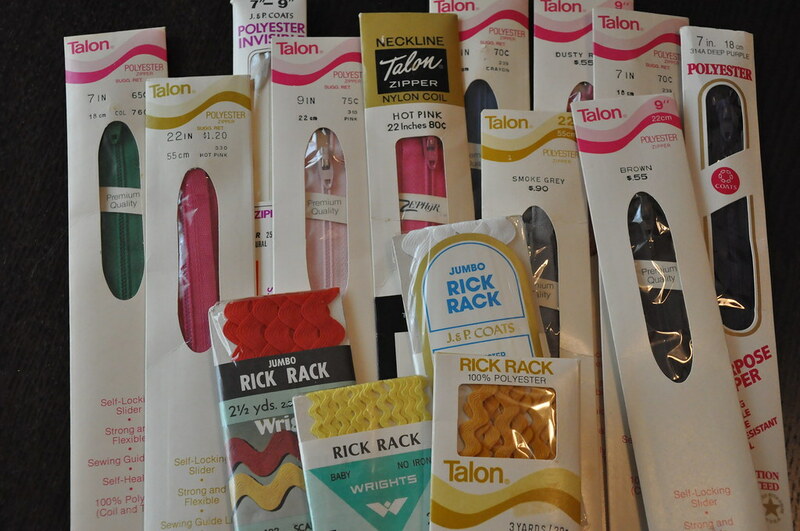 I never can pass up zippers or rick rack. Twenty-five cents a package. And then there was this $2 grab bag. 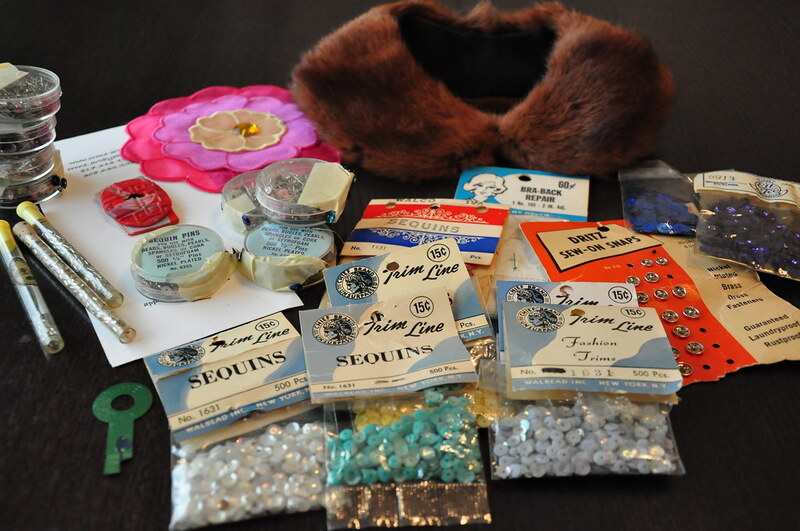 I wanted the sequins, but lucky me, I got the real (and really creepy) fur collar too! It's beautifully made, but icky. There's a handmade button in there, along with some snaps, bugle beads, and a bra strap extender. 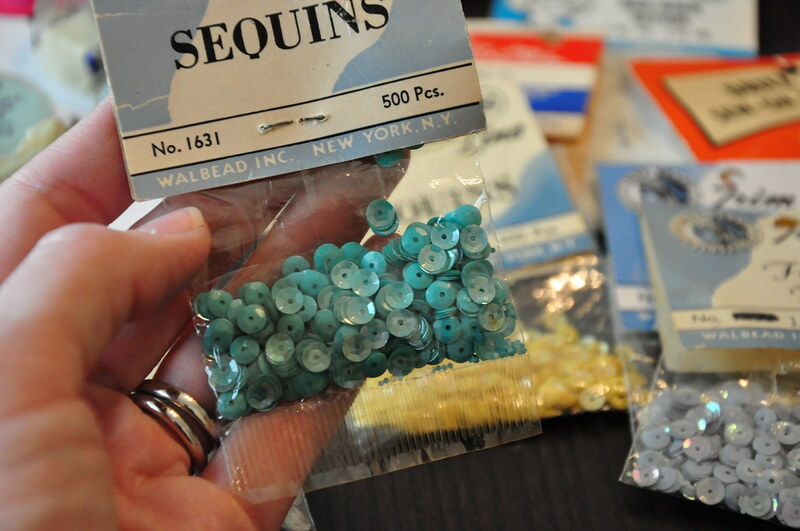 But, I thought these turquoise sequins were beautiful. As are those pretty pale blue ones on the right. I don't know what this little tool is. Any ideas? It was in the bag with the sequins, so I guess it's used for sequins? I'll have to do a little research. Wow, you really made out well at the thrift shop. I have no idea whatsoever about that little gadget. Don't you just love when the kids get involved in crafting. Score! What store did you go to? I know this is pretty old (well, only a few months! 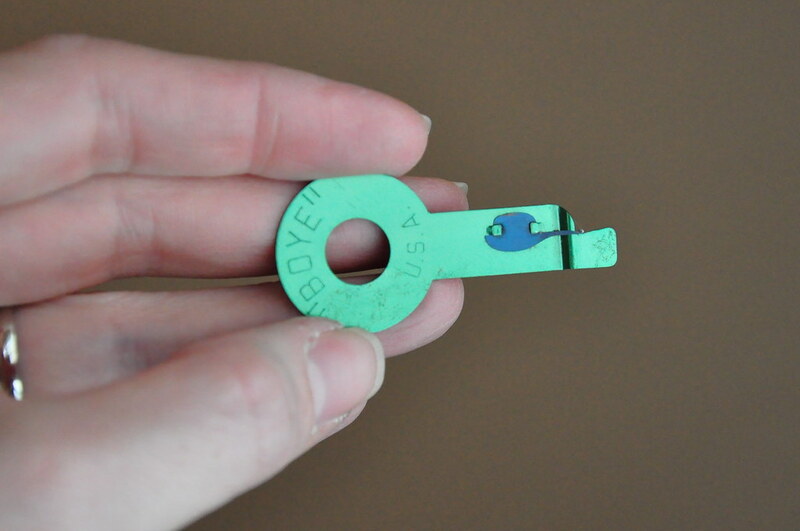 ), but did you ever find out what the blue tool was for? I'm just so curious! !